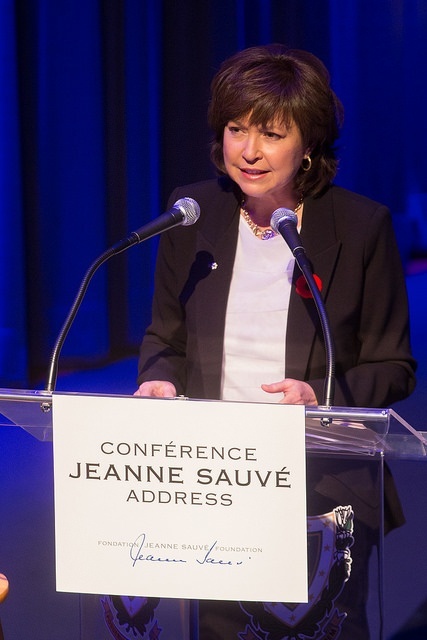 The Annual Jeanne Sauvé Address is the premier public event sponsored by the Jeanne Sauvé Foundation and the cornerstone of the Jeanne Sauvé Forum. Its aim is to engage the broader public on globally significant challenges while showcasing the innovations, achievements and impact of the Sauvé Fellows as emerging leaders in Canada and around the world. 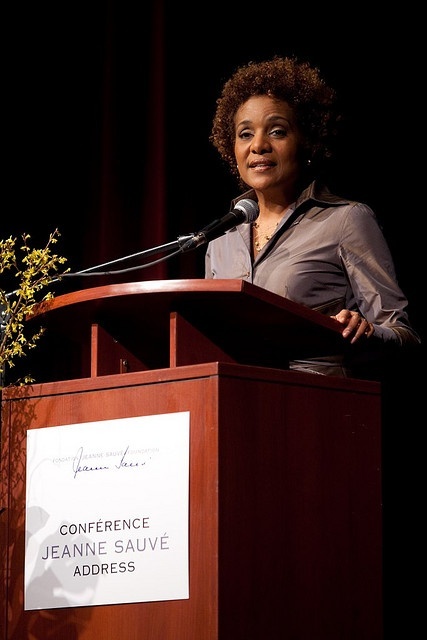 Since 2010, the Foundation has invited a distinguished Canadian woman to speak on an issue that represents the focus of her professional career. A discussion by a panel of Sauvé Fellows with interest in and direct personal experience of the issue follows the Address, ensuring that the audience enjoys a number of different perspectives. Céline Galipeau, the first woman to anchor Radio Canada’s flagship news program Téléjournal delivered an eloquent talk entitled Democracy in the Balance: Journalism in Canada and around the World (video) on November 7th 2014. 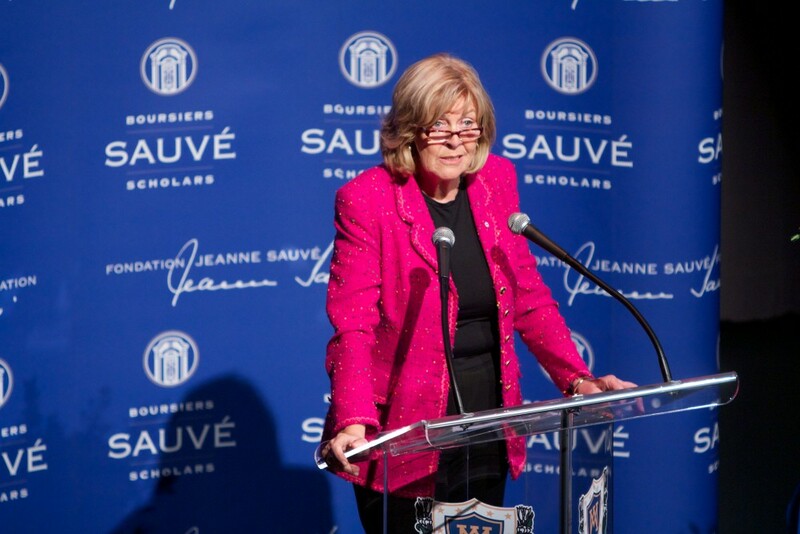 Following the Address, Mme Galipeau joined the panel of Sauvé Fellows for a probing discussion of a number of points raised in her talk. For photos of the 2014 JSA, click here. 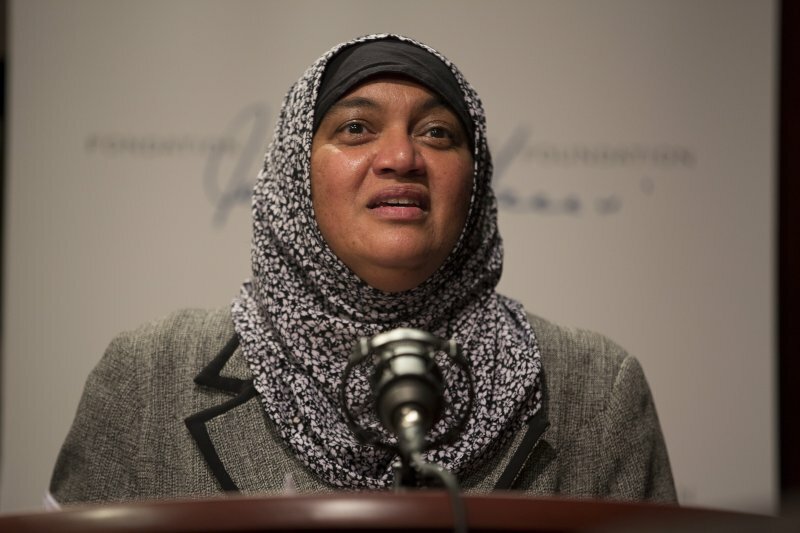 On 5 December 2013, the Jeanne Sauvé Foundation hosted the 2013 Jeanne Sauvé Address, Faith and Freedom: Promoting Religious Diversity and Gender Equality in Canada, delivered by Dr. Sheema Khan. Her eloquent Address challenged the audience – and all Canadians – to embrace an inclusive approach to religious and cultural diversity. Dr. Khan holds a Ph.D. in Chemical Physics from Harvard, and is the author of Of Hockey and Hijab: Reflections of a Canadian Muslim Woman. She co-founded the Toronto-based think tank The Tessellate Institute and, more recently, The Family Honour Project in London (Ontario), which is devoted to eliminating honour-based violence in Canada and abroad. 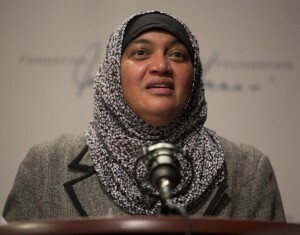 She is a Globe & Mail columnist writing on such topics as Reconciling Muslim practices with Western principles, and from 2000 to 2005, she served as chair of the Canadian Council on American-Islamic Relations, a grassroots advocacy group. Dr. Khan’s Address was followed by a lively panel discussion with Sauvé Fellows, moderated by Dr. Khalid Mustafa Medani, professor of political science at McGill University and a former Sauvé academic mentor. The discussion reflected on human and women’s rights globally as well as within the Muslim world. Saman Ahsan (2003-04 Sauvé Fellow) is the Executive Director of Girls Action Foundation, a Montreal-based charity working across Canada to build girls’ and young women’s skills and confidence and inspire action to change the world. Born and raised in Pakistan, Saman’s extensive work experience includes Manager of the Council of 100 Leaders: West-Islamic World Dialogue at the World Economic Forum, Coordinator of the Women, Youth and Environment Section of the Family Planning Association of Pakistan, and National Coordinator of UNICEF’s Girl Child Project Pakistan. She was a Fellow with the World Economic Forum Global Leadership Program, through whom she obtained a Masters in Global Leadership in 2008. Mirwais Nahzat (2009-10 Sauvé Fellow) is a public speaker, media commentator and international development consultant with over 12 years of experience in managing international programs. He currently works as a Kabul-based Consultant with Kardan University, where he oversees the business development, international relations and public engagement portfolios. Mirwais is also the founder of the Centre for Afghanistan Progress (CAP) and is the recipient of numerous awards in Canada as well as in his native Afghanistan. Sadia Rafiquddin (2011-12 Sauvé Fellow) is a Toronto-based photojournalist, public speaker and consultant for GrantBook, a social enterprise business. She uses multimedia storytelling to advocate for evidence-based policymaking at a local and international level. Born in Sargodha, Pakistan, the legacy of her parents’ move to Canada as refugees in 1990 has from a young age motivated her to pursue a life devoted to social justice. In recognition of this commitment, the Women’s Executive Network featured Sadia (then 22 years old) as one of Canada’s 100 Most Powerful Women. Sadia has received numerous other awards and honours for her social justice work. For photos of the 2013 JSA, click here. 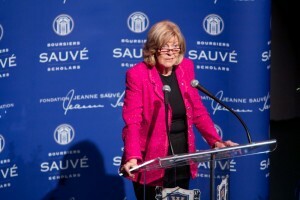 On 29 November, the Jeanne Sauvé Foundation hosted the 2012 Jeanne Sauvé Address, Truth and Reconciliation in Canada: Lessons Learned from Canada’s Residential Schools Experience, delivered by Commissioner Marie Wilson. Her very moving Address challenged the audience – and all Canadians – to engage in solidarity with survivors of Canada’s residential schools system and to support justice and healing. Commissioner Wilson’s talk was followed by a panel discussion among four Sauvé Fellows: Éloge Butera (2009-2010), Najme Kishani Farahani (2012-13), Tairah Firdous (2012-13) and Jonathan Sas (2012-13), and facilitated by Sauvé Program Director Simone Hanchet. 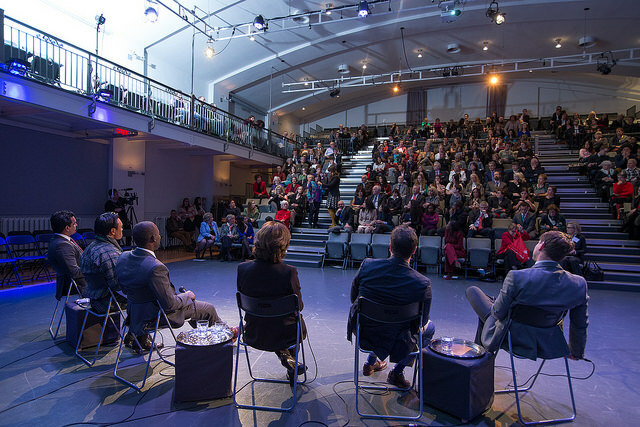 Drawing on their backgrounds and experiences as advocates of social justice in their respective communities, their discussion explored several themes, including awareness about the residential schools system both in Canada and internationally, education as a tool for oppression or empowerment, the power of trauma to carry forward through generations, the nature of individual and collective resilience, the relationship between truth and healing, and ways forward. The Sauvé Foundation is proud to support the work of the Truth and Reconciliation Commission, which will be holding hearings in Quebec as of early 2013, culminating in a National Event from April 24 to 28 in Montreal. Sauvé Fellow Jonathan Sas also filed this excellent report with Rabble.ca, covering both the event itself and his own in-depth conversation with Dr. Wilson. On 17 November 2011, an outstanding Canadian journalist and humanitarian delivered the 2011 Jeanne Sauvé Address. Sally Armstrong spoke passionately on The New Revolutionaries: Achieving ‘the Equality Effect’ for Women and Girls Around the World. 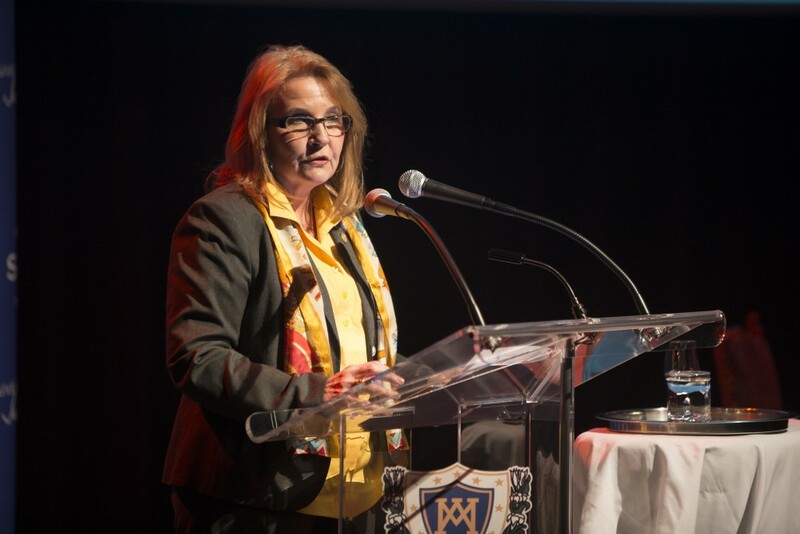 The event was held in the newly restored l’Ermitage of Collège de Montréal and was presided over by Mme Diane de Mailly Nesle Sauvé and Board member, Nancy Wright, who has known the Montreal-born Ms Armstrong for many years. 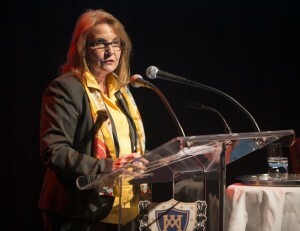 As promised in the invitation to attend the Address, Ms. Armstrong took “us around the globe, where localized acts of female emancipation are improving the prospects for humanity at large”. The acclaimed human rights activist, journalist and award-winning author, who spoke without a text, recounted her experiences covering stories about women and girls in conflict zones from Bosnia and Somalia to the Middle East, Rwanda, Congo and Afghanistan. The very engaged audience peppered her with questions at the end of her talk and crowded around her during the reception that followed.